While most types of clothing is wash and wear there are still some items that needed to be ironed. For this task one needs to rely on a iron that is going to be easy to use and give great results. This is something that the Panasonic 360 Freestyle Cordless Steam Dry Iron may be able to do. The Panasonic 360 Freestyle Cordless Steam Dry Iron with Curved Stainless Steel Soleplate is the result of technology hitting the iron market with the same force as it has hit every product we enjoy today. The main claim, other than the infinite convenience of having to no longer struggle with a cord when ironing, is the soleplate on this Panasonic 360 Freestyle Cordless Steam Dry Iron. As anyone who has ever ironed knows already the biggest pain in the rump is the fact that the soleplate on most traditional irons has a pointed end on one end and a flat or horizontal one on the other. This one is pointed at both ends which making ironing so much easier. The hype surrounding the Panasonic 360 Freestyle Cordless Steam Dry Ironis mostly from the above mentioned design that offers a pointed end on both ends of the iron meaning that you no longer have to try and turn the iron around to get into the small hard to reach places on your garments. The cost of the Panasonic 360 Freestyle Cordless Steam Dry Iron is $129.95. While this is bit higher than a more traditional corded iron the features included make it a great value indeed. No more commitment required for this iron than any other iron except that you will need to find a place to put the charge base to charge the unit when not in use. The base plate is actually a great place to keep the iron when not in use and the unit comes with a heat resistant cover that doubles as a carrying case. As far as irons go the Panasonic 360 Freestyle Cordless Steam Dry Iron does everything that a traditional corded unit will do only better! The pointed on both ends design makes doing pleats or tight areas much, much easier and the fact that you no longer need to wrestle with a cord while trying to wield a hot iron is a great and exceptionally safer design than previous irons have had. The water tank is fully removable so that you can fill it without having to try and direct the water into a little hole like other irons and without lugging the entire iron across the house. 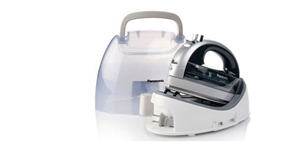 The unit features a 3 way auto shut off so that it is exceptionally safer than other models and the cordless design makes the use that much easier than any other iron we have ever encountered. As we have stated above this iron does everything that other irons can but better and more safely and with much more convenience than a traditional corded iron. Well -made and exceptionally well thought out in design and appearance, this IS the iron of the future. We are prepared to give this product a thumbs up. We would recommend this unit to anyone who wants a really well designed and functional iron that is safer and more efficient than earlier models. Another alternative that you may want to take a look at is the Eurosteam. What do you think? Does the Panasonic 360 Freestyle Cordless Steam Dry Iron work or not? Does Lovepop Cards Really Work?